Three neurologists are seeking more evidence-based research on the role of complementary and alternative medicine in neurology. The number of patients coming to their doctors' offices with questions about the complementary and alternative medicine (CAM) therapies they hear about online or from their peers is growing, and so, too, is the number of neurologists striving to offer evidence-based answers. Neurology Today spoke with three neurology researchers about the studies they are working on, what drives their interest, and how they translate it to their patients. All three said their initial foray into CAM research was a direct response to conversations with patients and the scarcity of high-quality evidence available at the time. Vijayshree Yadav, MD, associate professor of neurology at the Oregon Health & Science University School of Medicine (OHSU), was in her fellowship working with multiple sclerosis (MS) patients when she noticed a recurrent thread in her consultations. Apart from medication, patients “were interested in what they can do for themselves — diet, supplements. This was patient after patient, and everyone would have the same questions.” While Dr. Yadav was struck by this, she was also acutely aware that there weren't any established data sources at the time to direct the discussion. Dr. Yadav's mentor at OHSU was studying the role of antioxidants on MS and the effect of lipoic acid in animal models of the disease. Soon, Dr. Yadav began her own research on the first human subjects using lipoic acid in MS in a phase one study. Eventually Dr. Yadav's research interests opened the door to her lead contribution to the AAN guidelines on CAM therapies for MS (https://bit.ly/2OLEJeZ), which found, for one, that oral cannabis may be effective for the treatment of spasticity symptoms and pain. Currently, Dr. Yadav is engaged in several other studies in the field. For instance, last year, in September 2017, she and colleagues published a paper in Neurology: Neuroimmunology & Neuroinflammation, which found Class I evidence that patients with secondary-progressive MS had significantly reduced brain atrophy after taking lipoic acid. Using the preliminary research data collected by Dr. Yadav, her colleague Rebecca Spain, MD, MSPH, evaluated the possible neuroprotective effect of oral lipoic acid in progressive MS using brain MRI and found promising results. This work is now being further evaluated in multi-center clinical trial funded by the Department of Veterans Affairs and the MS Society of Canada. In another paper, Dr. Yadav and colleagues looked at the effects of a low-fat vegan diet known as the McDougall diet using magnetic resonance imaging (MRI) in MS patients. Dr. Yadav said they did not find notable changes on imaging in the one-year study period, but they did see a significant reduction in self-reported fatigue within a short time after the diet change. They are continuing this research using a slightly modified version of the diet to look at effects on MS fatigue. “When I first started, it felt like diet was too difficult to study, and frankly I feel like we broke that taboo. I feel very proud of our work,” she told Neurology Today. Dr. Yadav is looking forward to seeing further research into diet for MS, as well as the role of antioxidants in disease treatment. Sule Tinaz, MD, PhD, assistant professor of neurology at the Yale School of Medicine, told Neurology Today, “Actively engaging patients in treatment gives them a sense of control and empowerment,” which is why she is investigating the effects of neurofeedback-guided motor imagery training on motor performance and brain plasticity in Parkinson's disease (PD) patients using functional MRI (fMRI). “Motor imagery is a form of mental imagery and refers to the mental rehearsal of movements without overt movement. In brain imaging studies, motor imagery has been shown to recruit virtually the same brain regions as the actual motor tasks,” she explained. fMRI has been helpful in treating symptoms of conditions like anxiety and addiction, she said, by allowing individuals the ability to gain voluntary control over brain activity and also the behavior associated with this activity. “I think that the combination of neurofeedback and motor imagery has the potential to be used as an intervention for brain training to improve motor performance in patients with Parkinson's disease,” she added. So far, in a pilot study, Dr. Tinaz and colleagues reported “that using motor imagery of whole body complex movements (such as walking, balancing, calisthenics, etc.) in the scanner, participants with Parkinson's disease were able to successfully increase the correlated activation between two brain regions of interest,” the right insula and the dorsomedial frontal cortex. Dr. Tinaz said that these findings, though preliminary, were promising. She hopes to see improved brain plasticity and motor performance in patients with Parkinson's disease who use this training. They are currently recruiting patients for a larger clinical trial (https://clinicaltrials.gov/ct2/show/NCT03623386). Being proactive and maintaining a positive attitude make a big difference, Dr. Tinaz tells her patients. “Even in a neurodegenerative condition such as Parkinson's disease, there is room for improvement in brain plasticity, but it takes determination, engagement, and practice. Neurofeedback-guided motor imagery training offers them the opportunity to improve their brain plasticity, thereby, learn to move mindfully and become aware of their bodies more intimately as they move,” she said. Danny Bega, MD, assistant professor of neurology (movement disorders) at Northwestern University Feinberg School of Medicine, said he sees it as the responsibility of clinicians “to view [CAM] in a more evidence-based way — the same way that we would with any other kind of recommendations that we make to our patients.” Particularly with a disease like PD, and the broad way in which it can affect daily life, Dr. Bega said, there needs to be a holistic approach to treatment. In October 2014, Dr. Bega and colleagues published a review of the clinical evidence for complementary and alternative treatments studied for PD in Current Treatment Options in Neurology. Although several different approaches — herbal remedies and supplements, mind-body interventions, and other health care systems like Chinese medicine and Ayurvedic medicine — have been studied, the quality of a lot of the data was quite low, they found, possibly due to insufficient funding levels for this research and varying quality control in some countries. Dr. Bega has since worked on several small but promising studies in PD and cervical dystonia using CAM therapies. For example, in a 2016 pilot study published in the Journal of Yoga and Physical Therapy, Dr. Bega and fellow researchers found that individuals with PD who participated in yoga versus traditional exercise saw not only possible motor benefits, but also improvement in mood, overall quality of life, and anxiety levels. In another small study published in Parkinsonism and Related Disorders in 2017, Dr. Bega found that improvisation theater training for Parkinson's with The Second City, a well-known comedy group in Chicago, also appeared to improve quality of life, mood, and anxiety levels, as well as cognition — so much so that these classes have continued beyond the study. Dr. Bega and colleagues are also working to obtain funding for larger trials based on two small studies of acupuncture for cervical dystonia and dance therapy for PD. “These are just the small things that we've been trying to contribute to the field. I'm trying to raise awareness for the science to drive recommendations for these therapies,” he said. For his patients, Dr. Bega said he prescribes medication to address individual symptoms, but he also tells them, “You can't just passively take medications that I give you. The point of the medications is to help you so that you can exercise at a higher level, so that you can dance, so that you can do yoga, so that you can do these other potentially important interventions with greater ease,” he said. There's a middle ground that needs to be found, he added, between educating doctors about non-pharmacological approaches and also educating patients that not all herbal and “natural” therapies are necessarily safe or effective. Dr. Bega said he's looking forward to seeing higher quality research into medicinal marijuana for PD patients, as well as studies of functional imaging changes in PD patients while they are engaged in various forms of exercise or therapies. Is exercise actually slowing down progression of the disease or is it just making people more fit so that their symptoms don't seem as bad? “There is a voice now for [CAM], the medical societies are studying it, physician groups are advocating for it, and NIH has research funding for CAM therapies. These are good signs for the future of evidence-based CAM,” Dr. Bega said. •. Bega D, Gonzalez-Latapi P, Zadikoff C, et al A review of the clinical evidence for complementary and alternative therapies in Parkinson's Disease https://link.springer.com/article/10.1007%2Fs11940-014-0314-5. Curr Treat Options Neurol 2014: 16(10). •. Bega D, Palmentera P, Wagner A, et al Laughter is the best medicine: The Second City® improvisation as an intervention for Parkinson's disease https://www.prd-journal.com/article/S1353-8020(16)30432-1/fulltext. Parkinsonism Relat Disord 2017; 34: 62–65. •. Bega D, Park K, Grimone A, et al Acupuncture as adjuvant therapy for the management of cervical dystonia https://www.liebertpub.com/doi/10.1089/acu.2018.1291. Med Acupunct 2018; 30(4): 198–203. •. Bega D, Stein J, Zadikoff C, et al Yoga versus resistance training in mild to moderate severity Parkinson's disease: A 12-week pilot study https://www.omicsonline.org/open-access/yoga-versus-resistance-training-in-mild-to-moderate-severityparkinsons-disease-a-12week-pilot-study-2157-7595-1000222.php?aid=68242. J Yoga Phys Ther 2016; 6: 222. •. Michels K, Dubaz O, Hornthal E, et al “Dance therapy” as a psychotherapeutic movement intervention in Parkinson's disease https://www.sciencedirect.com/science/article/pii/S0965229918304175. Complement Ther Med 2018; 40: 248–252. •. Spain R, Powers K, Murchison, et al Lipoic acid in secondary progressive MS: A randomized controlled pilot trial http://nn.neurology.org/content/4/5/e374. Neurol Neuroimmunol Neuroinflamm 2017; 4(5): e374. •. Tinaz S, Lauro P, Hallett M, Horovitz SG. Deficits in task-set maintenance and execution networks in Parkinson's disease https://link.springer.com/article/10.1007%2Fs00429-014-0981-8. Brain Struct Funct 2016; 221(3): 1413–1425. •. Yadav V, Bever C Jr, Bowen J, et al Summary of evidence-based guideline: complementary and alternative medicine in multiple sclerosis: report of the guideline development subcommittee of the American Academy of Neurology http://n.neurology.org/content/82/12/1083.long. Neurology 2014; 82(12):1083–92. •. Yadav V, Narayanaswami P. Complementary and alternative medical therapies in multiple sclerosis—the American Academy of Neurology guidelines: a commentary https://www.clinicaltherapeutics.com/article/S0149-2918(14)00684-5/fulltext. Clin Ther 2014; 36(12):1972–1978. 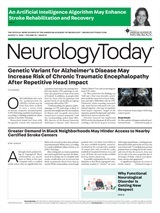 Neurology Today18(22):37-41, November 15, 2018.